The Information Technology Support Center (ITSC) deals with the growing IT related needs of the GCWUS community. 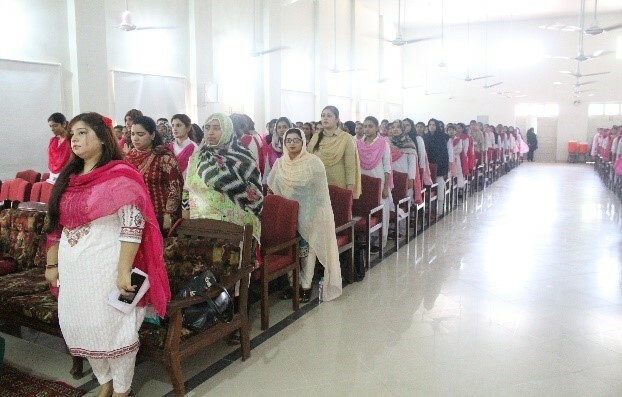 ITSC is responsible for the implementation of the broad IT vision of the Government College Women University, Sialkot (GCWUS) in terms of strategic central planning and operations. It provides technical support both to the academic community and the management of the University, making it easier for them to carry out their tasks and duties. Its priority is to meet all kinds of IT challenges through well thought out policies. And it is doing just that on account of a team of dedicated professionals who are always at hand to solve IT related problems and work towards expansion and betterment of the campus wide network. To provide excellent, innovative, reliable and integrated IT solutions, and quality services to the GCWUS community with organizational citizenship behavior to meet the challenges of the 21st century. 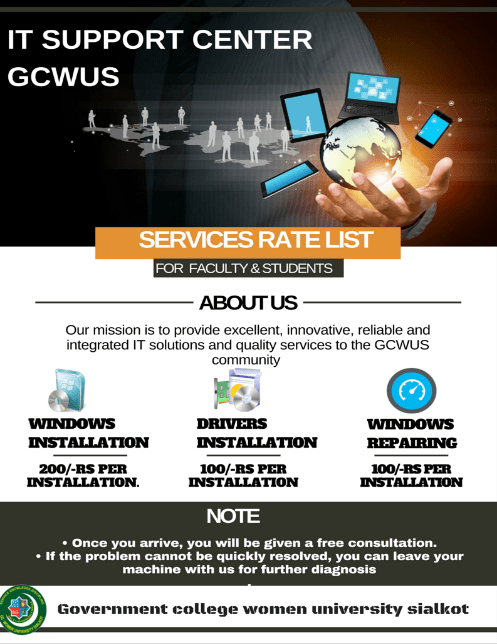 IT support center is GCWUS’s central technology unit providing the most effective and innovative and computing, communication and data services to its faculty, staff and students with a view to strengthen the competence of its academic enterprise. Our goal is to provide leading edge technological support to uplift the core value of teaching, learning and research, to diversify IT workforce and to cultivate state-wise public and private IT associations. As an integral part, IT Support Center looks after client’s PCs to address new/exiting maintenance and support requirements. This service provides support and maintenance of all network communication infrastructure required to sustain IT activities within University premises. 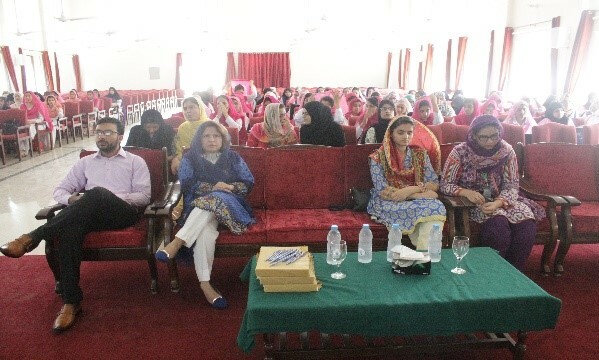 A project of Campus Management System (CMS) is in progress (initial phase) in the Government College Women University, Sialkot. Web section has been involved in all stages of the development of web site right from planning, design, quality control, launching to online promotion and monitoring. This service provides the facility to staff to communicate electronically via official email. You can use GCWUS’s webmail facility from anywhere in the world with access to the internet. 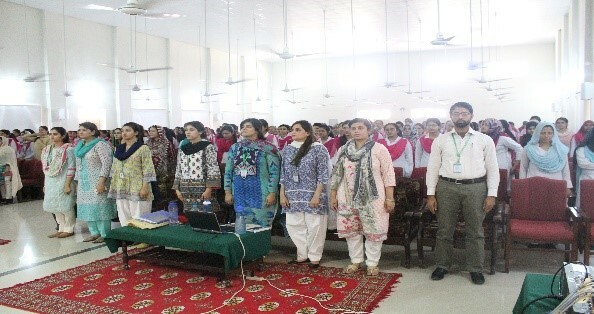 The software development section of Information Technology Support Center is actively participating in development of software system of Government College Women University, Sialkot. IT Support Center will provide its services regarding Audio/Video facilities for conferencing/lecturing/Symposium etc. within the premises of GCWUS funded by HEC (In Progress). Complaint management system is to register the complaints of the GCWUS’s staff for PC & Network Troubleshooting in order to solve them accordingly. The IT SUPPORT CENTER, at GCWUS is providing high speed internet facility to faculty, administrative staff, and students with 32 MBPS bandwidth through LAN as well as Wi-Fi on campus. IT Support Center has provided 450+ LAN wires and access points all over the University including departments, hostel, café and administrative block. 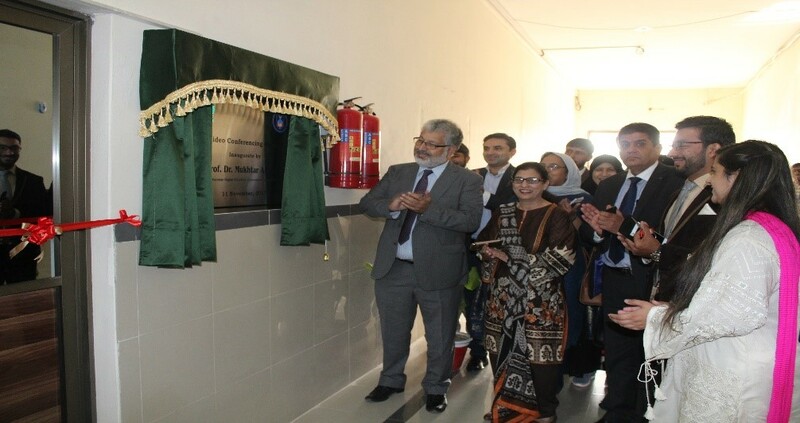 IT Support Center installed fiber optic cables throughout the campus of GCWUS for better connectivity and internet speed. for better monitoring and learning environment for faculty and students 24/7. For advance authentication, IT Support Center has launched a centralized attendance system with the help of 3 biometric devices at various places of the University. IT Support Center is also providing technical support to registrar and chief security departments in this regard. 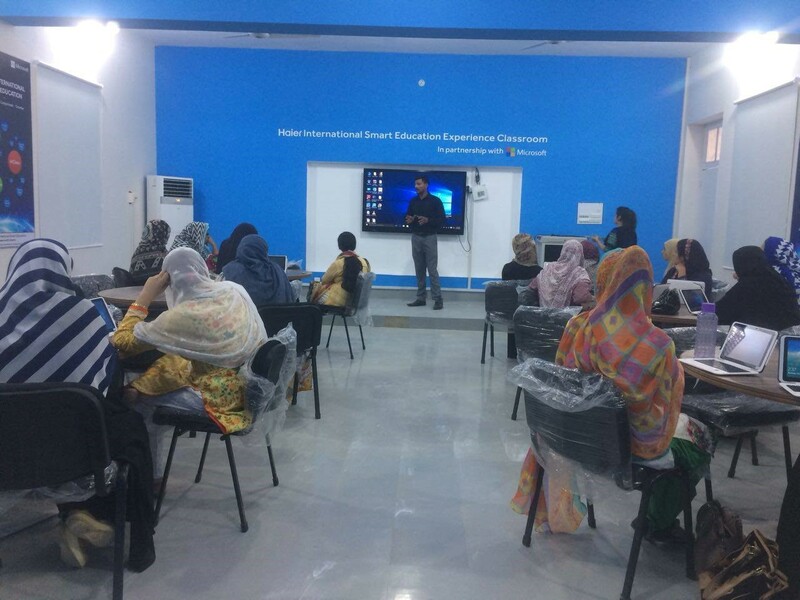 HEC and Haier have Collaboratively facilitated the IT Support Center to establish the Smart Classroom for students. It is a step towards future where students can learn and experience digital education through interactive board, digital projector, interconnected students and instructor’s laptops where instructor can digitally handle the student laptop by sharing learning materials and online quiz conduction etc. This lab is a great initiative for students conducting research. IT Support center is moving towards centralizing the University data. In this regard IT Support Center has developed and deployed HR Management system for registrar department to computerize the employee records (contractual, permanent, faculty, non-faculty). HR management system is totally based on user requirements that not only facilitate the registrar department but also the higher authority for decision making. IT Support Center has also developed and deployed student registration system for centralized data sharing. All student details of 2017 are entered in this software. ITSC plans to use this data for Learning management, fee management and examination management system. IT Support Center also conducted online evaluation of both faculty and courses for quality evaluation and improvement. This software helps quality evaluation department in improving quality education and recommendation in the form reporting. IT support center aims to facilitate students and faculty regarding IT related matters. It caters to all software as well as hardware issues. ITSC is also providing IT facilities regarding windows installation, driver issues, and hardware and software issues. IT Support Center started internship program to expand IT services for the community of GC Women University, Sialkot. IT Support Center hired 8 interns and assigned them to different departments i.e. networking cell, development cell, library, chief security office, lab management, web updation and designing cell. The team efficiently managed on-campus network, hardware, software, designing and development issues. IT Support Center provides facility to staff to communicate electronically via official email. University official email accounts have been issued to all faculty members, administrative staff and final year students for communication through electronic mail. 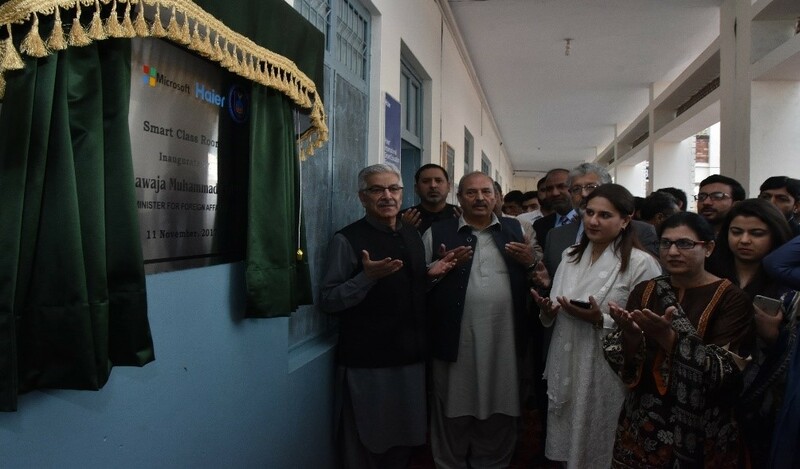 IT Support Center is providing Microsoft Learning Academy facility in collaboration with HEC to both students and instructor of IT/CS departments. It is providing an opportunity for curriculum resources for enhancing IT technical skills and professional certification preparation. IT Support Center is managing environment of instructor-led courses, student-led learning and self-development for both students and teachers. IT Support Center also manages Plagiarism software and accounts that are used by the researchers to make their research more useful and less Plagiarized. ITSC also facilitates the students in plagiarism checking. employees and students in collaboration with HEC and Microsoft. These accounts facilitate the users with professional Microsoft designing and development products. IT Support Center has also got Volume Licensing Service Center (VLSC) that provides access to free download product with key for both faculty/staff and students. IT Support Center has also made an agreement with Oracle Academy. According to the agreement, 150 faculty members of the GCWUS would be trained in Oracle Database Foundations, Database Design, Java Foundations, and Java as well as PLSQL Programming in three years to take up their responsibilities as instructors at the Oracle Academy. They would be allowed to use the Oracle Academy infrastructure to train another batch of 118 instructors. With the cooperation of Virtual University, ITSC is providing an Open Course Ware to the students of Govt. College Women University, Sialkot through an open courseware site. IT Support Center organized a seminar in collaboration with ORIC on “Introduction to IOT & Internet Security” on 9th November 2017. IT Support Center trained and certified 365 students including faculty/staff in MOS test in the months of November and December. IT Support Center organized a seminar on cyber challenges in collaboration with Internet Society on 15th March 2017. 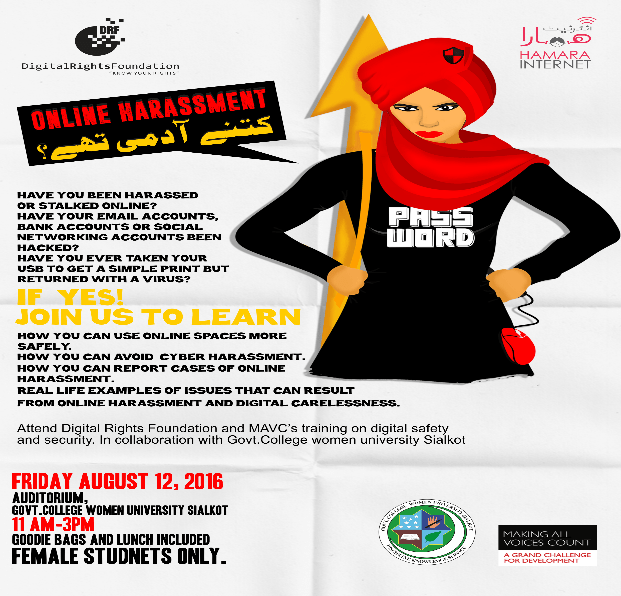 In the month of August, a seminar on online harassment was arranged by IT Support Center in collaboration with HAMARA INTERNET. IT Support Center organized a seminar funded by HEC, along-with the WEB-Master of IT support center Mr. Adnan Ashraf. 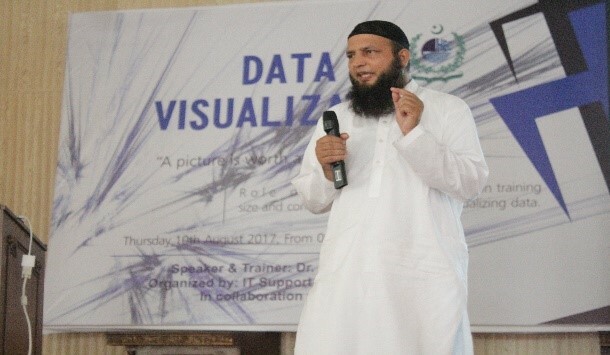 Worthy Dr. Abdul-Rahman from the University of Gujrat explained the whole idea and usage of data visualization and the language of R.
IT Support Center conducted a three-day Hands-on training related to three softwares named “Mendley, Gmail Cloud and Turnitin” to enhance the computer skills of faculty of GCWUS.